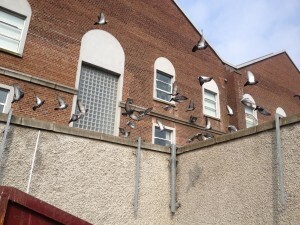 While feral pigeons can be found almost anywhere, they are particularly attracted to life in urban centres, industrial estates and derelict buildings. Pigeons have adapted extremely well to the urban environment, feeding in territorial flocks of 50-400 individuals. Pigeons thrive on food scraps and spillages, and congregate wherever these are readily available or provided by members of the public. Ledges, girders and holes provide ideal sites for their crude nests, which are made from debris and can accumulate a considerable thickness of droppings. Under favorable conditions pigeons will breed throughout the year rearing four to seven broods of two chicks on each occasion. They may lay more eggs before the previous young have fledged. Once they find a safe secure location to roost it does not take long until they habituate and the location becomes fully infested. Feral pigeons can cause an unsightly mess with their droppings and nesting materials. Birds and their nests, feathers and droppings are known to be reservoirs for a range of fungal and bacterial diseases, allergens, protozoan parasites, insects and mites harmful to human beings. An infestation of pigeons can mean that your business image and reputation is easily damaged. Clean-up costs are greatly increased. Furthermore there is a danger of slipping on bird droppings which presents a health and safety hazard. Acidic bird droppings can also seriously damage both stone and metalwork. Equally, the accumulation of nesting materials and droppings can cause water damage by blocking gutters and downspouts. The financial implications of loss of business, damage to buildings and health and safety prosecution risk can be considerable. Apart from the filth feral pigeons cause, they are known carriers of up to 60 transmittable diseases many of which are contagious to humans such as Salmonella, Histoplasmosis, Crytococcosis, Psittacosiss. Particularly within the food and drinks industry there is a serious danger of cross-contamination with product and packaging which can result in a damaged reputation or litigation. Wildlife Management Services have been providing effective management programmes for feral pigeons for the last 12 years and are experts in the field. Please click on infestation removal, proofing, falconry service and distress call systems, for some further information on the solutions that we can offer. 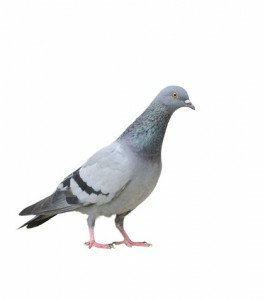 Please contact us at 087 6410206, 057 8623042 with your feral pigeon problem.